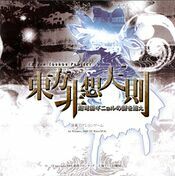 Utsuho Reiuji (霊烏路 空, Reiuji Utsuho) is the main antagonist of Subterranean Animism. She's one of Satori Komeiji's pets and Hell raven who has lived in the underground world since before it was separated from Hell. Her job is to regulate the flames of the Hell of Blazing Fires. 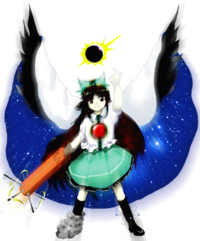 Utsuho first appeared as the Final Boss of Subterranean Animism, and was indirectly the main reason that the events of Undefined Fantastic Object occurred. 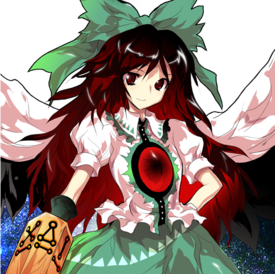 She also appeared as a playable character in Touhou Hisoutensoku, appearing as a boss in Sanae Kochiya and Cirno's scenario. She was a target on Stage 8 in Double Spoiler and appeared in the background of Hopeless Masquerade. With the left leg "the leg of decomposition" and the right leg "the leg of fusion", therefore by that which controls this, the right arm's "third leg" (control rod and fuel rod)[Ref. Needed], she is able to manipulate the ultimate energy, nuclear fusion. Her abilities come from the god of nuclear fusion, Yatagarasu, and were granted to her by Kanako Yasaka in the god's attempt to turn the Hell of Blazing Fires into an energy source for Gensokyo. Essentially, this means that Utsuho's own body actually houses a divine spirit, technically making her into a branch shrine for Yatagarasu. Apparently, the duller the holder of the power, the better they can utilize it. The red eye on her chest is proof that Utsuho obtained the power of fusion by absorbing Yatagarasu because the god's eyes are red, according to Chapter Three of Cage in Lunatic Runagate. In the outside world, the prospects of putting this to use have still not been reached, and thus can surely be said to be an illusionary power. Yatagarasu is the Misaki God of the Nihon Shinwa. In Nihon Shoki, as the messenger and envoy of highest sun god of the Nihon Shinwa, Amaterasu Oomikami (天照大神), Yatagarasu is considered the incarnation of the sun. It has been said that Yatagarasu possibly lives in the sun. That is, it means that she's able to manipulate the same temperature as the the highest heating power in the natural world, the sun (Furthermore, by the spells that she uses, she is also able to spring forth the same gravitational attraction). However, Utsuho can't keep creating energy forever on her own because she would run out of "fusion material", and as explained in one of the endings for Subterranean Animism, she needs to get the atoms used in the fusion process from someone else. Utsuho's job is to manage the temperature inside the Hell of Blazing Fires, by either opening the skylight above the Hell of Blazing Fires's courtyard to lower the temperature, or feeding the fires with the corpses carried by Orin. Her full name is Utsuho Reiuji (霊烏路 空). The characters for Reiuji (霊烏路) literally means, in succession, "soul/spirit", "crow/raven", and "path". Utsuho (空) means "emptiness/empty-hole/cave" in Old Japanese. It would be supposed to be pronounced as "utsuo" if we did after the old style. A similar case is Sanae's position "hofuri" vs. "hōri". They are examples of Japanese counterparts of spelling pronunciation. The character for Utsuho also means "sky", and can be pronounced "kuu" in a compound word. Hence to her name, her nickname is Okuu (おくう), which was first used by Rin Kaenbyou to refer to Utsuho in the Extra Stage prologue. At first, only the "おくう" spelling used in Subterranean Animism was canon and "お空" (spelling using the kanji from her actual name) was not, but after Aya Shameimaru called her "お空" in the comment of scene 8-6 in Double Spoiler, both became canon; this was used again in the data files for Hopeless Masquerade. Also, "O-kuu" (おくう) is a pun of "Oku-u" (屋烏, lit. "a crow standing on a roof"), although this is not likely to be intentional. Utsuho has long dark brown hair. Wears a white short-sleeved shirt with a red "eye" in the center, a short green skirt, and a green hair-ribbon. On her right arm, she wears a device reminiscent of a nuclear control rod. She also wears a cape that's white on the outside and a starry pattern on the inside; the cape is kept aloft by her black wings. Her right foot is encased in congealed matter, representing the "elephant's foot" of Chernobyl, a mass of cooled radioactive material and glass. Her left ankle is orbited by electrons. 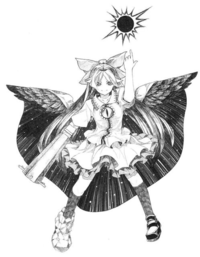 On the Interview of Cara☆Mel‎ vol.8, ZUN mentioned that he tried to keep her from being indecent during the design process by adding a cannon on her arm instead of having an additional leg, thus solving the analogy of the third leg of the Yatagarasu. Before the events of Subterranean Animism, she was told by a voice that she could swallow the god, Yatagarasu, that was hidden in the flames to gain a power that would fulfill the wishes of both the worlds below and above the surface. This power was nuclear fusion. Utsuho misunderstood what the voice had told her, and decided that, using these powers, she would take over Gensokyo. Her friend, Rin Kaenbyou, became worried about Utsuho, and drove evil spirits to the surface to cause an incident among the strong youkai above ground, in hope that they would come down to do something about it and, when they got there, defeat Utsuho and bring her back to her former self. What came, however, was not a strong youkai, but a strong human. 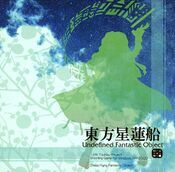 In Undefined Fantastic Object, it is revealed that the geyser she created with her newfound powers wound up blowing Byakuren Hijiri's ship out from the underground and into the sky, thus starting the plot of that game. Utsuho becomes a playable character in Touhou Hisoutensoku. She treats Sanae Kochiya and Cirno as objects interfering in the fusion process that can possibly cause malfunction to the core and attempts to eliminate them, after both fall in the Underground Geyser Center where she lives. In Double Spoiler, Utsuho appeared as a stage 8 target, where she uses a few spell cards and had Aya Shameimaru and Hatate Himekaidou take photos of her and her danmaku. Utsuho made a background cameo appearance in Hopeless Masquerade on the Palace of Earth Spirits and Youkai Tanuki Forest stage. She is seen enjoying the fights. In Wild and Horned Hermit, Utsuho's Yatagarasu powers are stated as an imperfect power source by Sanae Kochiya. She's one of Satori Komeiji's pets. In order to maintain the Hell of Blazing Fires and Palace of Earth Spirits working in proper order, Satori appointed various jobs to her pets. She tells Utsuho in a dream to consume Yatagarasu and this gives her nuclear powers. However, she misunderstands her and uses these powers in a attempt to take over Gensokyo, which causes the events of Subterranean Animism. Utsuho and Rin Kaenbyou are really old friends, since before the Underworld separated from Hell. They've known each other even before Satori started taking care of them. She is her master Satori's younger sister. 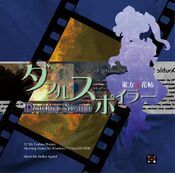 A silhouette of Utsuho occupies the front of Subterranean Animism's jewel case. Her "Third Leg" resembles an arm cannon. In Touhou Hisoutensoku, it is used as one. Utsuho appears to be the only final boss in a Windows game whose goal is explicitly conquering the world. A very common goal for villains in cartoons. Utsuho's spell cards "Giga Flare" and "Mega Flare" share the name of the attacks used by the summon Bahamut of the Final Fantasy series. 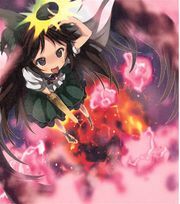 Utsuho is one of the two only bosses in a Windows game that gives the player a warning before the spell card begins; "☢ CAUTION!! ☢" appears for a few moments with Klaxons blaring in the background. The other one belongs to Koishi, which warning Klaxons blare in the background in the "Philosophy of a Hated Person" spell card. Her sprite animations in Touhou Hisoutensoku greatly resemble and are most likely a homage to Souther of Hokuto no Ken fame, even having a spell card attack similar to Souther's Fatal K.O., Nanto Hō-ōh Ken Ougi: Tenshou Juuji Hou. Because of this fans sometimes call that spell card Nanto Hō-Ōkuu Ken Ougi: Tenshou Juuji Hou. In Utsuho's Spell Cards, the background behind the trefoil is a photo of the Carina Nebula. Utsuho's spell card background also features a real-world picture of a cat on the trefoil. One reason ZUN might've included this in the background could be because of the wild cats that have colonized the abandoned city of Pripyat. Pripyat was the town created for the families of workers at Chernobyl in Ukraine, and after the disaster that happened there, the population was evacuated. Recent excursions back into the ghost town lead to the discovery of a small community of irradiated wild cats that live comfortably in the foundations of abandoned homes. Furthering the Chernobyl links, Utsuho could be a reference to the so-called Black Bird of Chernobyl not only because of her massive black wings, but also because the red eye in her chest, which was another trait of the Black Bird. And this "eye" in the center of her chest looks similar to one of J.R.R. Tolkien's creations, the Eye of Sauron. In PC-98's Story of Eastern Wonderlands, there was an orange-like shine on Stage 4 in the background that was shaped like the orb that Utsuho points to in her Subterranean Animism portrait. Utsuho's orb also resembles the shining objects, a stage enemy of the same game. Two of her alternate palettes in Touhou Hisoutensoku resembles her master Satori and Satori's sister Koishi. Another palette resembles Kanako Yasaka. A crow that gives off a conspicuously-colored light. Finally, on her right arm is that which controls this, the "Third Leg"
Using these three legs, it's said she can control the ultimate energy. When she awoke after a long sleep, the Earth Spirit Palace stood above what was once the Hell of Blazing Fires. In this time when the underground was no longer part of hell, criminals were no longer banished underground, and the only ones that lived underground now were the hell ravens, the kasha that carried off the bodies of the dead, and various other curious youkai, as well as the evil spirits who only acted out of malice. Satori took the youkai who lived there as her own and raised them as pets. Utsuho and Rin were both Satori's pets. Rin and Utsuho both worked hard at their respective jobs, Rin at controlling the evil spirits, Utsuho at managing the former Hell of Blazing Fires. If the flames became too hot, they'd open the skylight in the courtyard; if the flames became too weak, they'd throw in more of the corpses Rin carried off; they regulated the flames in this manner. They lived out their lives this way, doing the same thing every day but leading a peaceful, satisfying life. However, one day that peaceful lifestyle was shattered. Someone from above stole into Hell without anyone noticing. Then, she began to speak. Her voice stoked Utsuho's curiosity. "The Hell of Blazing Fires hides the secret to the ultimate form of energy that humans can attain. You should be able to contain that power within your body. We can use that to bring about the wishes of not just the underground, but the above ground as well." She was enveloped in light, and she felt someone entering her body. When she came to, her body had changed greatly. Utsuho enjoyed using her new power, and before she knew it the Hell of Blazing Fires had regained its original heat. That heat boiled the water in the underground, and when the steam pressure reached its limits it boiled over into the above ground as a geyser. The one from above ground. Who was she, and what was her purpose? Utsuho quickly pushed such questions from her little head. The power that had entered her body was the god called the yatagarasu. It's said to be a three-legged crow that lives on the sun. The ultimate power the yatagarasu possessed was the power create atoms, nuclear fusion. Atomic energy is the ultimate fantasy left for the future. This page was last edited on 23 August 2018, at 01:08.